After some initial hiccups, the site to reserve your Boundary Waters permits is open and operational, and there are still some permits available. Deciding which entry point to go in at is tough — do you pick an old favorite or somewhere new? Even more baffling is which combination of lakes, rivers, ponds and portage trails will make up your route. There’s still time to reserve a permit and decide on a route. To get help inspire you, here are four loops (or near loops) that some of our members suggested. These canoe trips range from four to six days and as far as difficulty goes, they run the gamut. Of course, everyone has their list of favorite lakes and routes in the BWCA. Let us know yours in the comments section. Overview: This route begins on The Little Indian Sioux River and leads into large bodies of water, ultimately ending on another river, the Moose. Overview: Starting on Fall Lake you travel north into Basswood Lake and after two days or so of paddling, around the time you start to miss portaging you portage back towards Fall Lake. 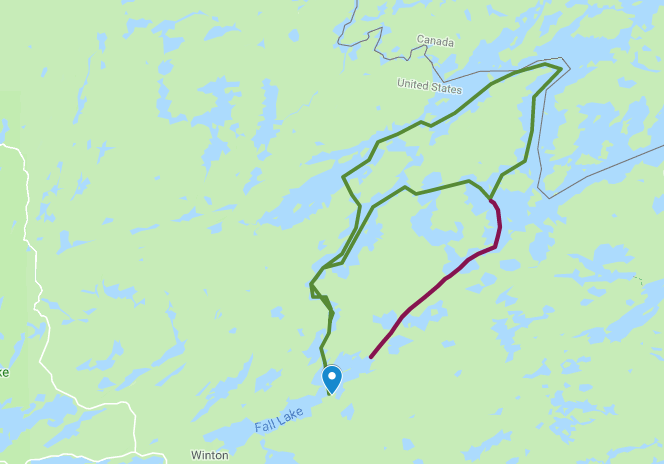 There is an alternative way to finish, (the red line) in which you continue south to an old logging road that is mostly grown over, submerged under water, and four miles long. Unless you have a sadistic sense of fun, we don’t recommend attempting this. Length: Approximately 30 miles. 3 to 5 days. Highlights: Lots of lakes and not a lot of portages! Alternatively, bragging to your friends about the four-mile portage you did. Overview: This is Cliff Jacobson’s favorite route, which is saying something. And it’s a challenging one. So be ready for lots of short portages, beautiful lakes and a small, intimate stream. Highlights: Paddling the Frost River is a unique and intimate experience. You really get the sense you’re hundreds of miles away from anything on this route. Overview: There are a lot of lakes in Minnesota, but not a lot of mountains. What we got is beautifully displayed in this route that features bluffs, cliffs, long lakes and stunning overlooks. Entry/ Exit Points: Enter at #60 “Duncan Lake.” End at Clearwater Historic Lodge. Highlights: After you huff it through the Baby Grand Portage (600+ rods) you arrive at a series of small lakes hemmed in by stunning mountains. Truly awe inspiring. Once you portage onto Clearwater Lake, don’t forget to turn around. It’s silly gorgeous. Needless to say, we didn’t even scratch the surface of the possible routes out there. Grab a few maps, bring your imagination and tell us what you adventure you concoct!